Valley City (CSi) The Valley City Commission met in Regular Session Tues evening at City Hall. Commissioner Powell was not present. Mayor Carlsrud asked for a moment of silence in observing Peace Officer Memorial Day. Block off Main Street for Memorial Day event. From the audience Gary Schelagel, spoke, and suggested improving street light standards, and lighting configurations. The City Commission considered the First Reading of an Ordinance Amending Title 4, Alcoholic Beverages City Attorney Mertins explained language changes, including new classes of license concerning microbrewers. Amendments also deal with license suspensions, and extentions of licenses, along with granting licenses to flower shops serving alcohol. Commissioner Magnuson said the public should have input in creating new license categories. The City Commission on Tuesday, took no action on the First Reading. KLJ said the low bid was 5.2 percent over the engineer’s estimate, at $1.02 million. 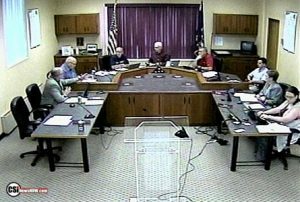 The City Commission approved awarding the bid to Swanberg Construction, contingent on approval by the NDDOT. $3,000 of the cost to be Special Assessed, less than anticipated. Cost sharing was including. Considered was a Resolution accepting the Bid and Awarding Contract for Project No. UGP-SU-2-990(057), Central Avenue Streetscape and Concrete Pavement Repair, this year. KLJ said the low bid from Strata Co was over 21 percent higher than the engineer’s estimate. The City Commission voted to reject the bid, and proceed with October 2018 rebidding. Commissioner Bishop voted in opposition, siting the anticipated cost of the project. Approved a Construction Engineering Services with KLJ for Paving Improvement District No. 114 (7th St SE Mill & Overlay) in the amount of $34,750. City Commissioners approved a Construction Engineering Services with KLJ for Paving Improvement District No. 117 (2018 Mill & Overlay and Seal Coat) in the amount of $56,500. Construction to start in June this year. Approved was the Preliminary and Design Engineering Agreement for 5th Ave NW Street Reconstruction from Main Street to 12th Street NW in an amount not to exceed $144,500. Commissioners approved a Special Alcohol Beverage Event Permit for RND Inc. dba NuBar for Rally in the Valley Street Dance on June 16, 2018. Approved a Special Alcohol Beverage Event Permit for The Captain’s Pub for Rally in the Valley Street Dance on June 16, 2018 City Auditor Richter said the three establishments are working together, and for the time frame of 9-p.m., to 1-a.m.
Approved a City Commission schedule change for City Commission and Finance meetings to be held on Monday, July 2, 2018 City. Approved was advertising for bids: the sale of City Parking Lot south of Hub-Mac more specifically described as Parcel Number 63-3473111, Lots 3-6, Block 31 Original Townsite. City Administrator Schelkoph said the bids will be opened on June 4th, with the commission to consider at the June 6th City Commission meeting. David Schelkoph thanked city crews in collecting items for citywide cleanup. He said Valley Recycling will take metal items not collected during the cleanup. Grass clippings and tree disposal site available residential only, and for city residents. Fire Chief Gary Retterath reminds citizens to use care in using outdoor firepits and have a hose on standby. City Police Chief Hatcher, noted National Peace Officers Memorial Day, and pointed out the number of officers who gave their lives in service to law enforcement and their communities. He pointed out that law enforcement has the highest number of suicides, of agencies. KLJ gave an update on construction projects and startup projects, including the permanent flood protection project. Commissioner Bishop thanked police officers and fire fighters for their service. Mayor Carlsrud also thanked crews for their work on citywide cleanup, and also asked citizens to thank police officers and fire fighters for their service.